You can purchase it for $35 plus $6.50 postage. 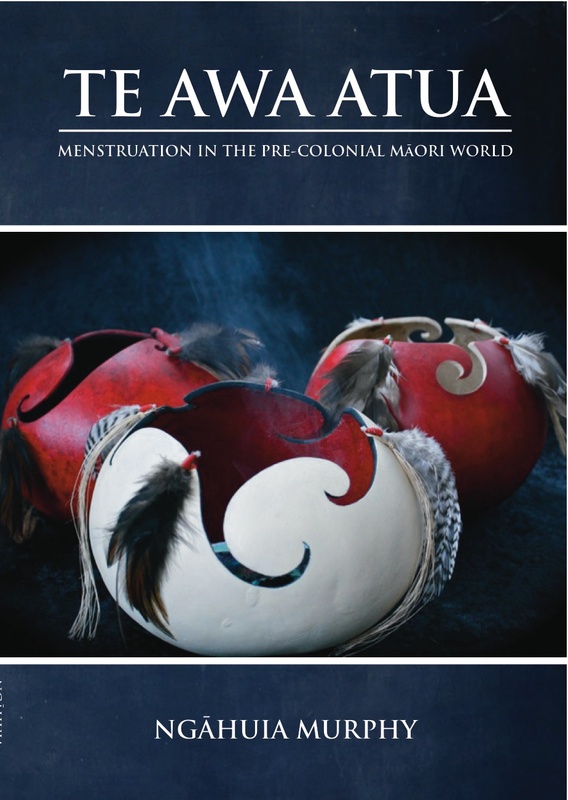 Te Awa Atua: Menstruation in the pre-colonial Maori world (2013) is taken directly from my Masters thesis and includes all the elements you’d expect in an academic work, including a discussion of how I went about doing the research and my findings in detail. Te Awa Atua is a groundbreaking study of menstruation in pre-colonial Māori society. Many early ethnographic accounts of menstrual rites were distorted beyond recognition by the colonial lense of their authors, yet their misinterpretations continue to be accepted as authoritative. This book is a challenge to that authority. By examining stories about menstruation located in Māori cosmologies, tribal histories, oral literatures, ceremonies and rites, Ngāhuia Murphy argues that menstruation was sees as a medium of whakapapa (genealogy) that connected Māori women to their pantheon of atua (deities). Ancient rites, recorded in tribal songs and chants, reveal that menstrual blood was used for psychic and spiritual protection. These examples reveal striking Indigenous constructs of womanhood that radically challenge notions of female inferiority and menstrual pollution. Waiwhero: He Whakahirahiratanga o te Ira Wahine: A Celebration of Womanhood is based on Te Awa Atua but has been written specifically for whanau, rangatahi, the education and health sectors. Waiwhero is also bilingual, having been translated by the wonderful Sean Ellison, making it a great reo and kaupapa Māori sexual health resource (a rarity!). Regan Balzer has also illustrated the book and provided beautiful paintings of the cosmological origin stories for menstruation. Waiwhero is a smaller book and an easier read but necessarily leaves out a lot of related material. It’s perfect for mums, aunties and nannies to share with their girls. Having said that there is a reason why Sean Ellison translated the work. Men have a role and place in this korero. For our tipuna Waiwhero was a whanau issue not a women’s issue because it assured the continuation of whakapapa lines. Some of my biggest supporters in the mahi have been Māori men. I have heard wonderful stories around the motu about koro’s massaging their moko’s and preparing special kai during this time, solo dads doing the best they can to reclaim empowering tikanga for their girls, as well as the traditions of male midwifery that have been largely severed through the imposition of legislation. It’s important that Māori girls are taught about the mana and tapu of their bodies but it’s just as critical that the boys are taught too so they do not continue to perpetuate patriarchal and colonial attitudes. To order books, please deposit the full cost including postage into ANZ 01 0315 0160455 00 and use your name as the reference. Then email me at poitahu@gmail.com with your name, address and confirmation of payment. If you buy more than one book, postage is $7.50 for up to 5 copies. Kia ora where can i buy your book? Email poitahu@gmail.com for a copy of Te Awa Atua ($35 + $6.50 tracked postage). 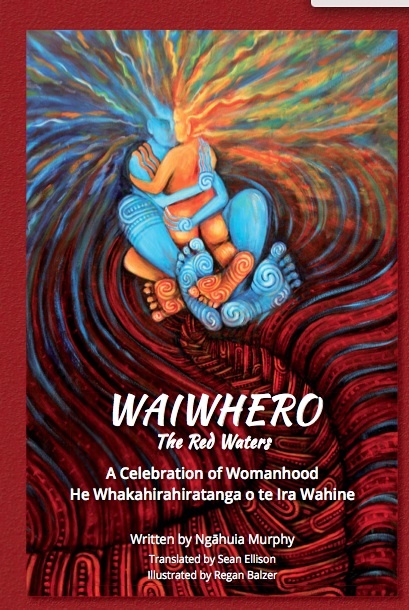 Waiwhero: He Whakahirahiratanga o te Ira Wahine: A Celebration of Womanhood has just been published and can be purchased by emailing me ($25.00 +$7.50 tracked postage). Kia ora NGahuia, whats your email? How much ids your book ? I am messaging from McLeods Booksellers Ltd. We have a customer who is interested in your book ‘Te Awa Atua’, and just wondering how much it is to bookshops? Ko au he tētehi o ngā tauira o Te Poutāhu Ahunga Tikanga, nō Te Wānanga o Raukawa. I noho whakarongo au ki tō taha mai te hui ā waea i tēnei tau, i te taha o tāku pūkenga o te tohu nei, ko Āneta me te whānau. Ko tāku tino hiahia, ko te hoko pukapuka Waiwhero hei rauemi, hei taonga, hei paipera tapu mō te tapu me te mana o mātou ko ngā taonga o ngā Atua, mō tōku nei whānau. Ahakoa, ko tāku hoa rangatira, ko ngōku tamariki me ngōku mokopuna, ahakoa ko wai, kei a mātou te taonga ko koe i tuhia. Nō reira e whae, ngā mihi aroha ki a koe mō tō rangatiratanga hei whakaawatea ngā kōrero tawhito, hei whakarite, hei whakaoho ko ēnei o ngā tikanga tawhito, mai ngā mātāpono o tētehi o ngā wakapapa o te orokohanga o te ao nei. Aroha atu mō tōku tuhingaroa. I te wā ka huihui mātou i tino whakamā au ki te whakatakoto tōku whainga e pā ana ki tēnei kaupapa, aroha mō tāku hē. Tena koe Rossana, kia ora rawa atu koe mo enei korero whakamihi, whakanui ki taku mahi. It was such a wonderful surprise to get your message as I was unsure about sharing korero over Skype..Heoi ano, of course it would be my pleasure to get a book to you. Are you able to email me at poitahu@gmail.com with an address and confirmation of payment ($25 + 7 postage) and I will get the pukapuka to you asap. Ka nui nga mihi ki a koe me te whanau hoki, Ngahuia.